Brad Terry grew up in Stamford, Connecticut, and these days presides over an international jazz career from his world headquarters in Bath, Maine. Among the notables he has played with are Dizzy Gillespie, Steve Swallow, Roger Kellaway, Red Mitchell, Lenny Breau, Buddy Tate and Buck Clayton. Brad travels regularly to Europe, where he performs and conducts workshops, particularly in Poland, where he works with young musical prodigies. Brad has helped to develop some wonderful Polish jazz musicians, who now, themselves, perform to appreciative audiences throughout Europe. He plays the clarinet today because of the encouragement of a friend and Connecticut neighbor way back in his childhood, none other than one of the most famous clarinetists of them all, Benny Goodman. Through practice and performance, Brad began developing his musical abilities. As he began to show promise, he was taken under the wing of saxophonist and Basie Band member Buddy Tate, who took his young protegé into Harlem jazz clubs and got him up on bandstands with some of the day’s greatest jazz musicians. Brad is also, famously, a jazz whistler, one of the few to develop that specialty and practice it so artfully. And two years ago, he added another skill to his resumé, that of author, as he published an autobiography titled I Feel More Like I Do Now Than I Did Yesterday. The title says something about Brad’s sense of humor, which is never very far below the surface of any conversation with him. Revealed in the book is a central fact of Brad Terry’s life, something he learned about himself only when he was 58 years old: Brad has, and has always had, attention deficit disorder (ADD). It explains a lot about the course of his musical career, in which he was essentially self-taught. And while Brad’s playing has earned him praise from such luminaries as Jim Hall, Roger Kellaway, Gene Lees, Doug Ramsey, even Dizzy Gillespie, the truth is, he can’t even read music. After repeated attempts, even at some of the world’s most renowned music education institutions, he could never learn to read it. He had to wait until he was well into his middle age before he finally knew why. Certainly music is the river that runs through Brad’s life. But it’s only one of a number of interests and accomplishments that have defined his life. Looming large among them—second only to music, it must be said—was Brad’s “Island Camp.” Every summer, for twenty-five years, Brad recruited 16 teen-aged boys, some of them disadvantaged and on “scholarship,” and ran a six-week-long camp off the coast of Maine, organized around a few simple principles devised by Brad, but mostly improvised around his particular set of skills and interests. A large section of Brad’s autobiography is devoted to letters and emails from former campers— now adults, of course—who testify to the central importance in their lives of the experience of that camp and of their love and enduring respect for Brad Terry, from whom they learned life lessons—and, of course, a deep appreciation of music. 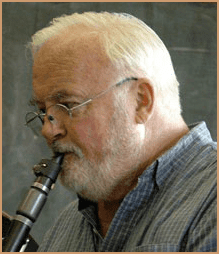 Brad has been a frequent presence over the years here on the Seacoast—performing at the original Seacoast Festival, at The Press Room and other venues—and so has many friends in the jazz community here. Many of whom, no doubt, will look forward to being in his audience on January 19 as the next featured artist in the Seacoast Jazz Society’s ongoing Seacoast Jazz Appreciation Project.